I have stayed in two yurts in Utah before, and the Norway Flats/TUNA Yurt was my 3rd trip to a yurt. 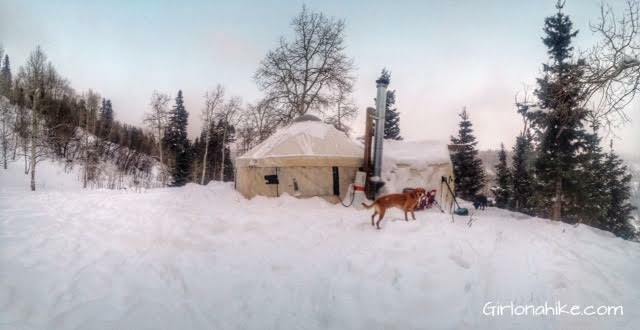 Most yurts are owned and operated through the National Forest Service (NFS), however TUNA (The Utah Nordic Alliance) has owned a permit given to them by the NFS in 1996 to privately operate this yurt, and allows them to keep this yurt up year-round. 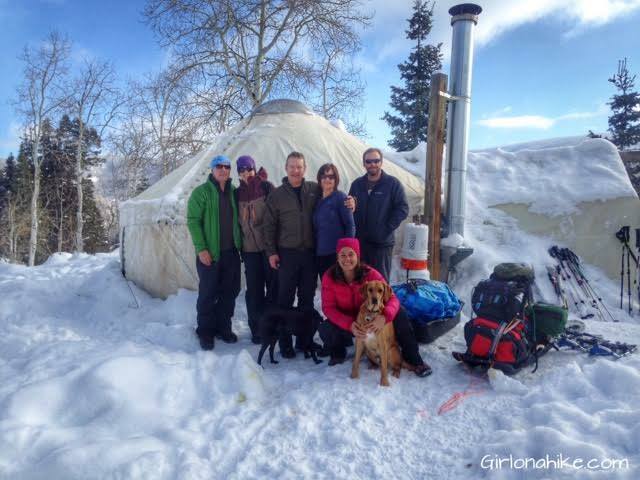 Yurts are a great place to spend time camping, hiking, skiing, snowshoeing, and enjoying the back-country. 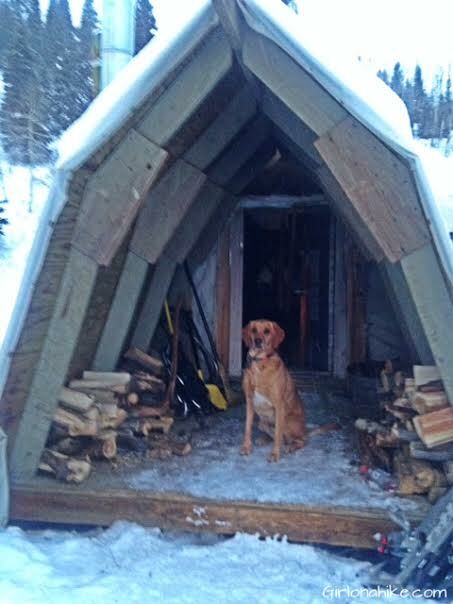 The Norway Flats Yurt is one of the few yurts that actually allows dogs as well (with prior permission from TUNA). Reservations usually open up in mid-October and get filled very quickly, so call in late September to find out when they start taking reservations. For rates & reservations, click here. I highly recommend that you stay at least two nights. One night is not enough time to fully enjoy the yurt experience. 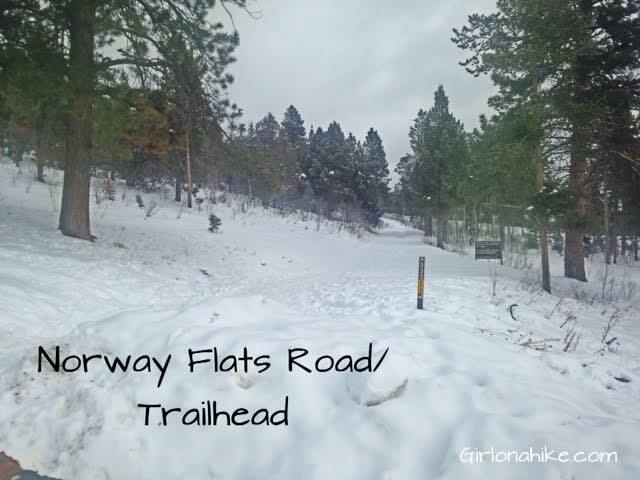 The Norway Flats Yurt sits at an elevation of 8600 ft., and is located on a flat bench over looking the Boulder Creek. There is excellent ski terrain below and to the East of the yurt, with 300-400 ft vertical slopes ranging from 30-35 degrees. 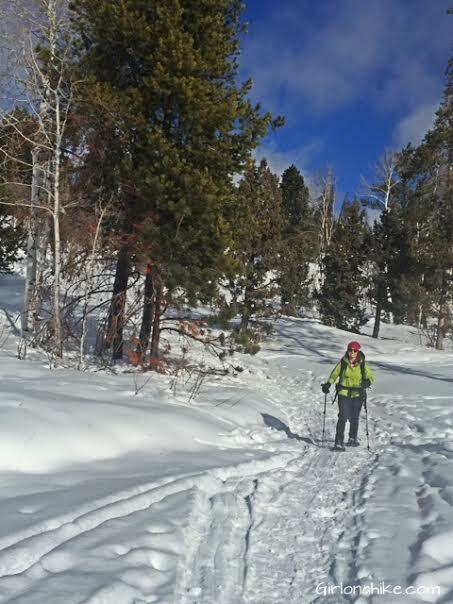 Moderate snowshoeing is also abundant, as there are two old jeep roads you can follow for as long as you'd like. 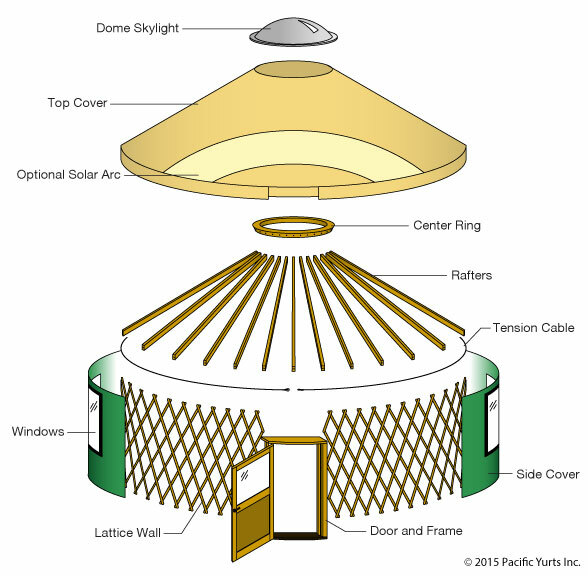 This yurt is 18 ft in diameter with a covered deck/storage area. The max amount of people allowed is 8, however I recommend a max of 6 or 7 so you have bunk space to put your gear/clothes/food, etc. 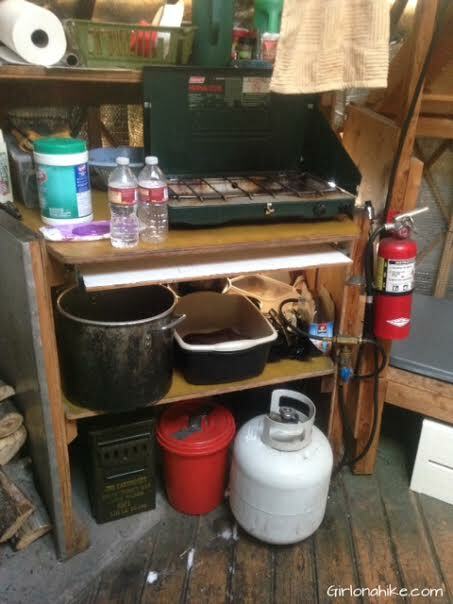 There is a wood stove and a supply of split wood, a propane cooking stove and one lamp, and all cooking equipment including pots and pans and utensils. There are mugs provided but no plates. Be sure to bring your own. 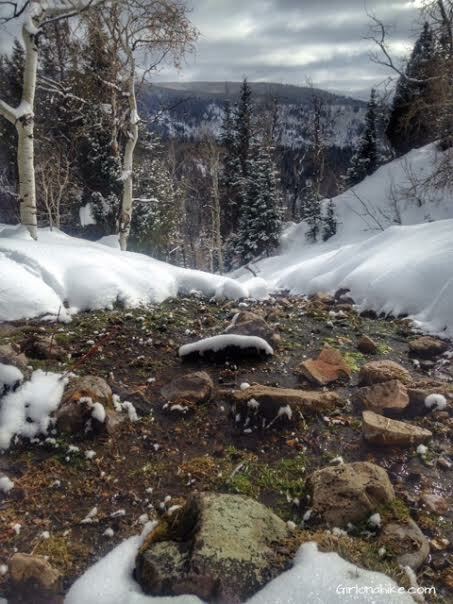 There is also a natural spring by the yurt where you can get drinking water. Even though its natural, I recommend bringing a water filter or boiling the water. 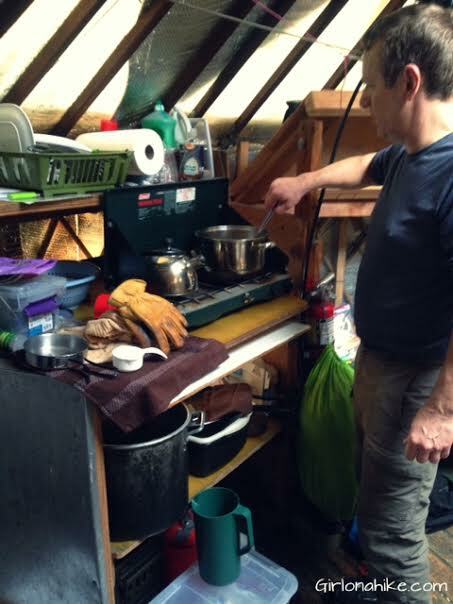 The yurt also provides a few extra blankets and sleeping bags, and a first aid box. There are 4 stools, so if you have more than 4 coming, bring an extra backpacking chair or sit on the supply boxes. 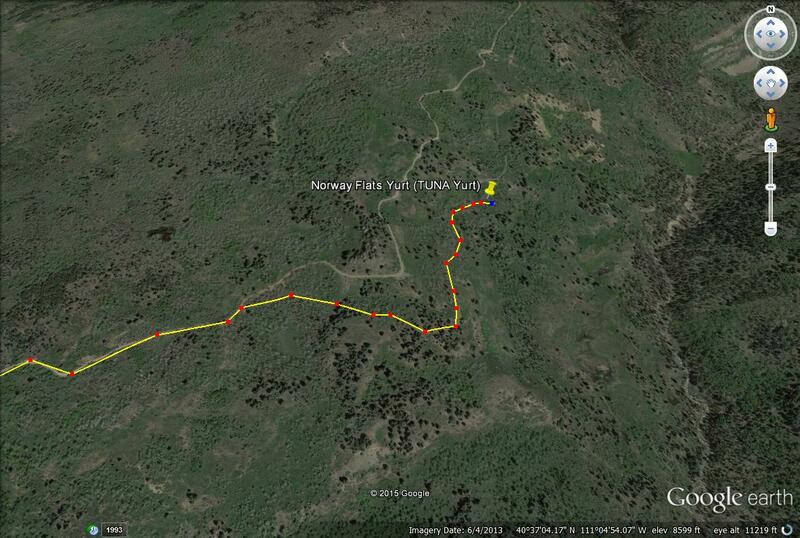 Directions to trailhead: The yurt is on the Norway Flats Road, off the Mirror Lake Highway in the Uintas. Parking at the trailhead is 10.5 miles from Kamas, UT, which is between mile marker 10 and 11, and parking is located on the left side of the road with a small turn off. It is almost directly across the road from the Lower Provo/Pine Valley Group Campground road. There is no large sign on the Mirror Lake Hwy marking this road, but there is a small sign that says "035", however it may be covered with snow. 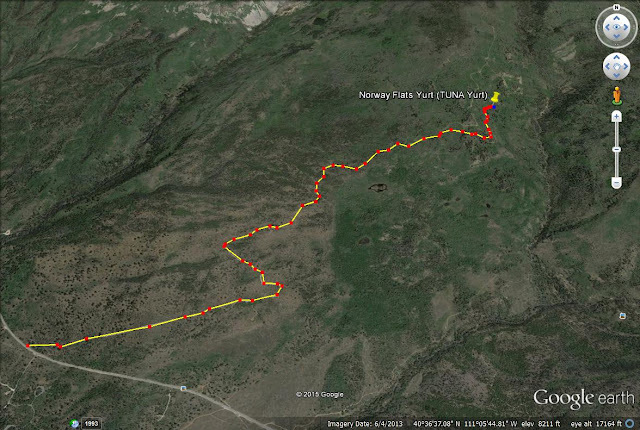 Directions to the yurt: To get to the yurt you just follow the Norway Flats Road for about 2.75 miles. It winds around some - starting off heading Northeast, bending back to the West, then heading North. You will see a few areas where it looks like the road branches off, one will be signed for Road 035A, but don't take any of those. After 2.75 miles, the road will keep going straight and there will also be a branch of the road that bears off right. There is one of those tall, skinny brown plastic Forest Service signs with "no motor vehicles" symbols. Take this branch. About 10 yards down this branch there is a rail fence across the road. 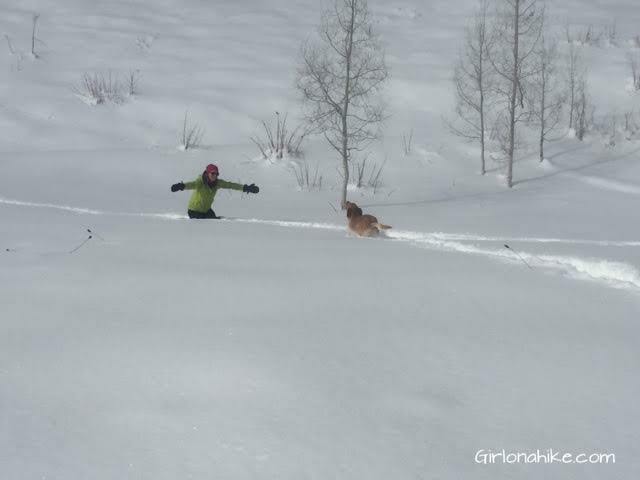 This may be covered with snow, and if carrying your gear up in a sled, you will need help getting over this low fence. This branch descends for a bit, then you will have to go around a big dead tree. Work your way around the bluff, and descend a bit more. As the road starts to climb, you will see another low rail fence. There is a blank square sign, again enforcing no motor vehicles. Standing there to the NE and 100 yards away, at about 2 o'clock is the white yurt. Because the yurt is white, it may be hard to see with snow or in the dark. 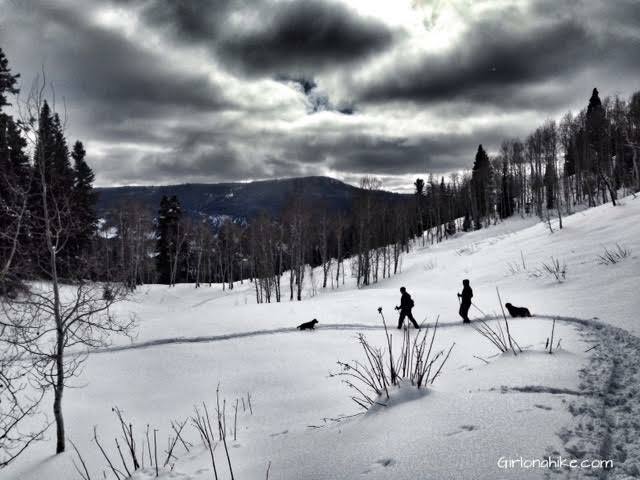 If you are carrying a backpack or using a sled to haul gear up, it can take up to 3-4 hours to reach the yurt. Give yourself enough daylight to get there. Here is what the road/TH look like. You should see the brown road sign for 035. 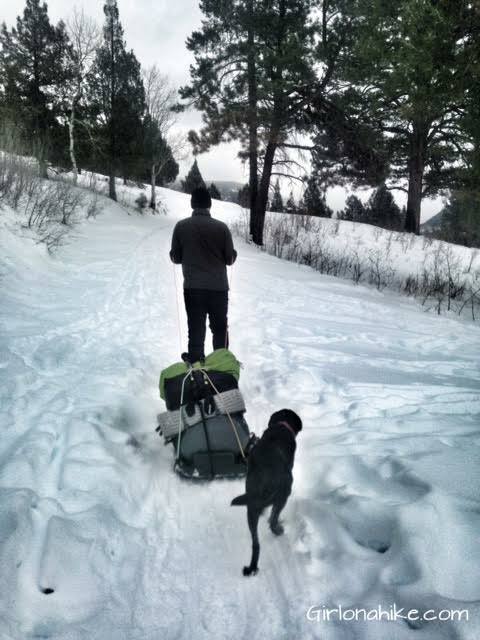 Starting out Larry and dog Lucas get the sled situated to haul in our gear and food. The trail was fairly packed down and easy to follow. Here's the branch off the main road, 035. Take this for the yurt. We arrived to the yurt just as the sun was setting. It took us 3 hours from the TH to get here. Ever wondered what the inside of a yurt looks like? Here it is! 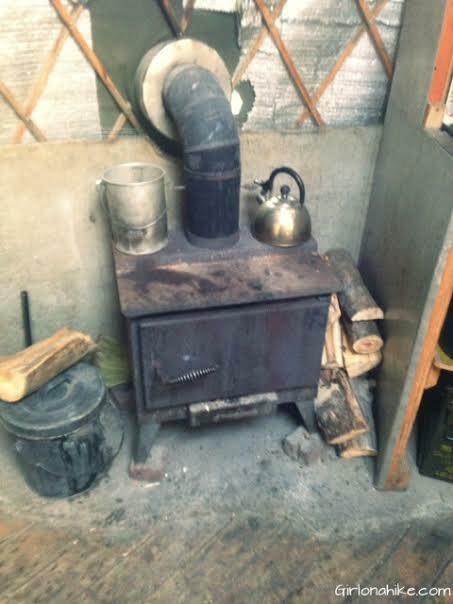 Bunk beds, a wood burning stove, and camp stove are provided. A round table was also provided and we set that up in the center, after we removed the snow from the top of the yurt, and removed these center poles. The center poles need to be put up after you leave the yurt, in case of a large snowstorm. The poles help support the center of the yurt from collapsing. The yurt also has mats to sleep on, but they were rock hard. I recommend bringing your own thermarest. Charlie greets us at the entrance. The outhouse complete with a carved moon on the door. DO NOT put toilet paper down the hole. You will need to bring a paper bag to put toilet paper in, then burn it before you leave. 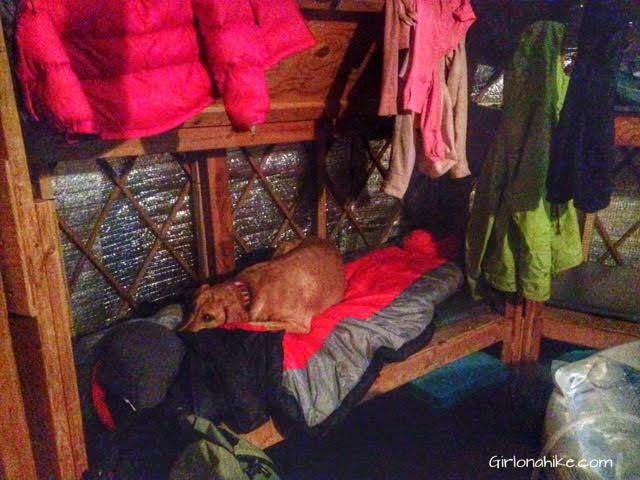 Charlie chills inside the yurt. I made him sleep on the floor on a blanket at night, but during the day he liked being on my sleeping bag. 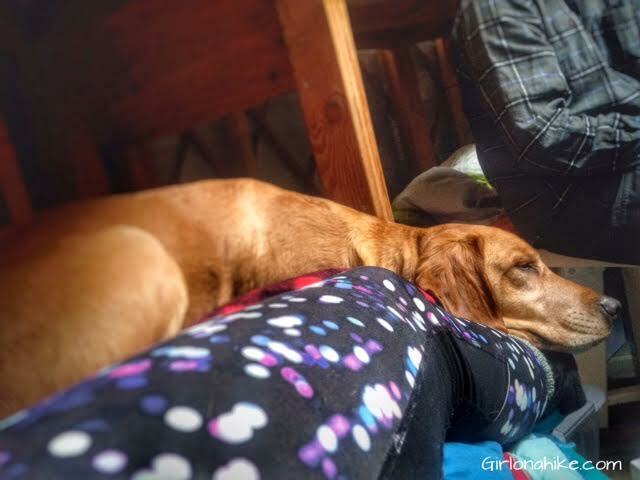 Charlie took lots of naps in the yurt. With how warm and cozy it was, I don't blame him! 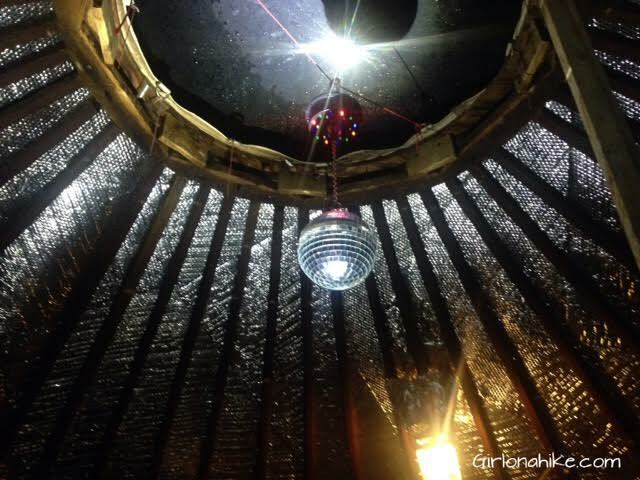 The Norway Flats Yurt is the only yurt I've been to with a disco ball. It made for pretty lighting at night. This is the natural spring to get your drinking water from. Remember to always filter water in the back-country even if it is from a natural source. 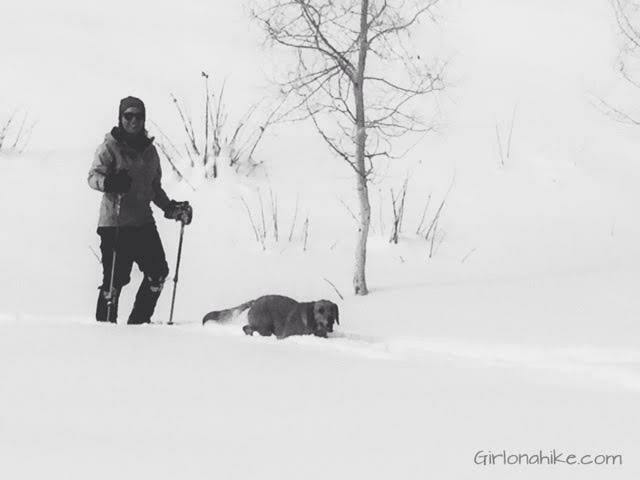 Our full day at the yurt, we went out for a quick snowshoe. 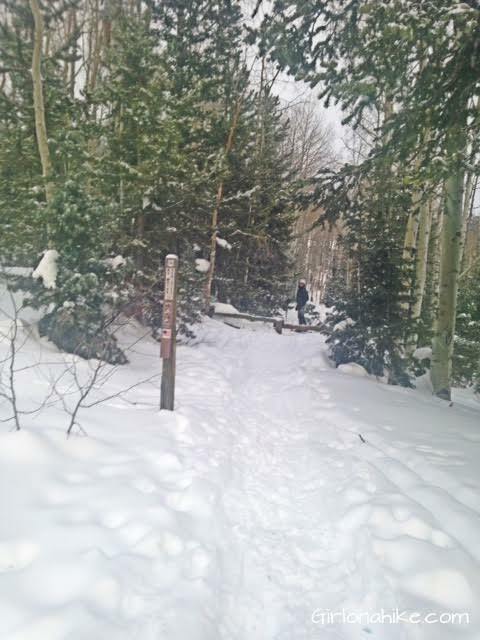 I broke trail the whole way, and it was about 1 ft deep of fresh powder. 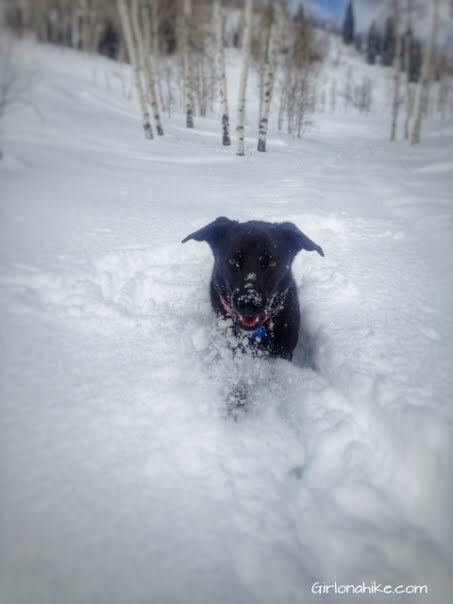 Lucas got a doggie snow beard! 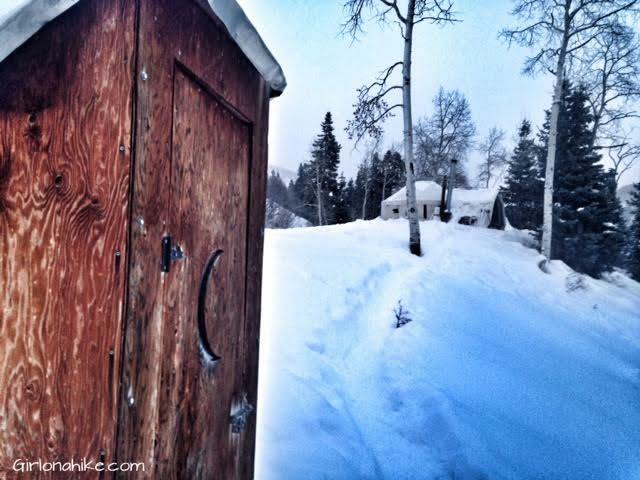 Heading back down to the yurt from out snowshoeing adventure. After snowshoeing, playing Catch Phrase and Phase 10, napping, cooking up some delicious meals, playing music and talking, it was time to head down after our second night there. It snowed lightly the whole time, and on our way out we got beautiful blue skies, and had a great view of the Boulder Creek valley. 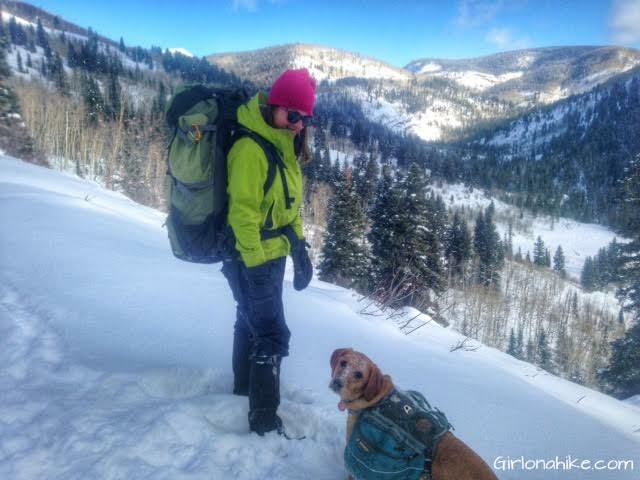 Read about what I wear while hiking and backpacking in Winter! Heading down to the cars, we had a great view of Pine Valley. Group photo! We had seven people and four dogs total. We couldn't have asked for a better weekend to adventure here. 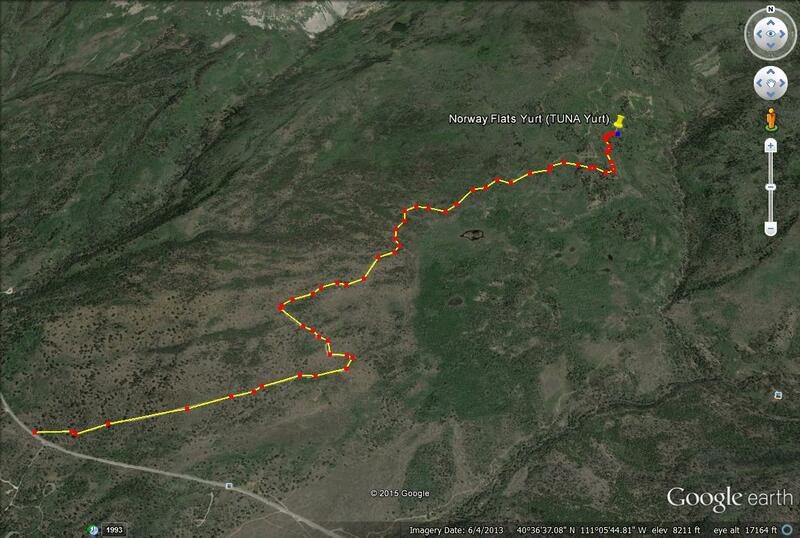 Here's is an overview of the trail to get to the yurt. 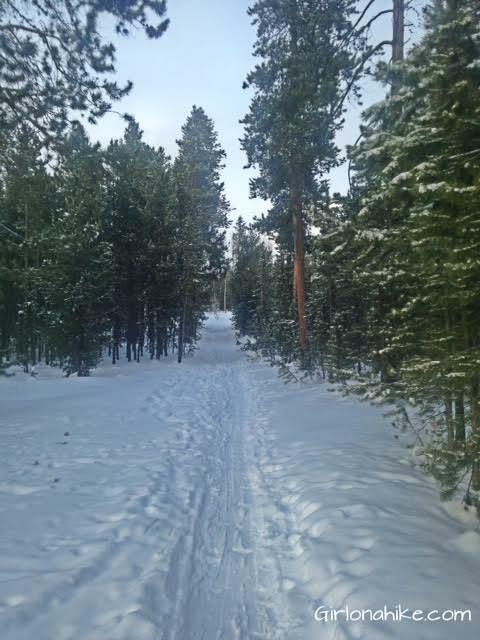 Here's a close up of the trail split to get to the yurt. 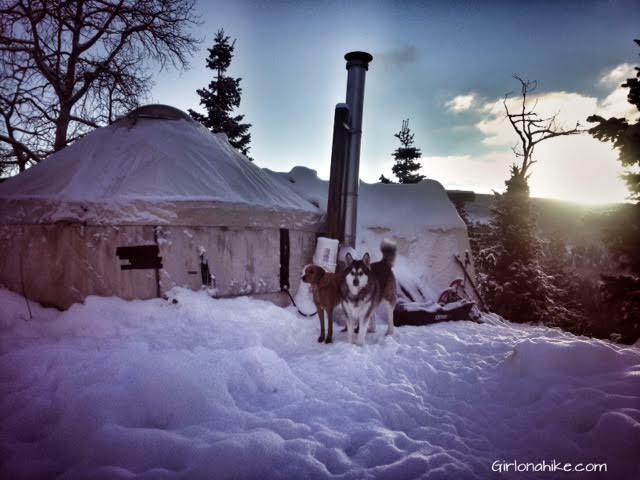 Have you stayed in a Yurt before? If so, which one? Post your comments below! omg what a blast! I have always wanted to make it to one of the yurts for dinner, but this looks like so much fun! Great write up. I love the detail that would allow me to do this trip without so much research. You would love it! 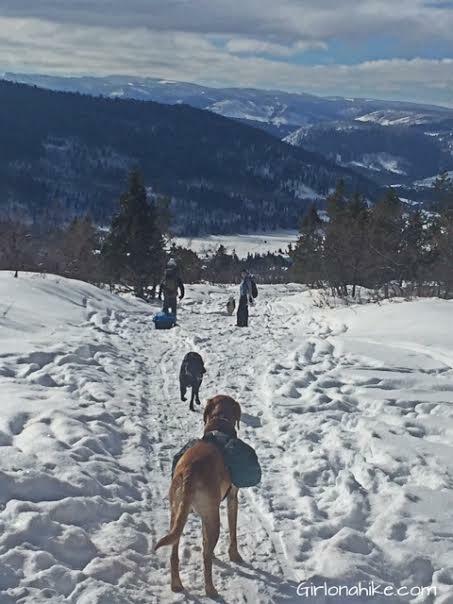 So much fun to go with a group of friends and the dogs this time.